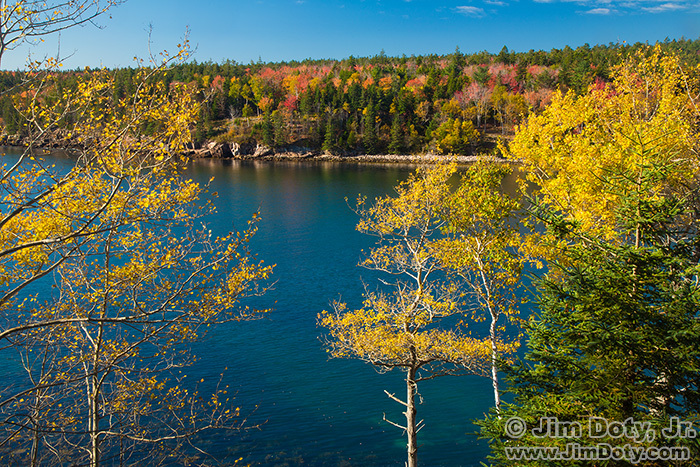 If you have been reading the last few posts, it will not surprise you to know that most of my favorite photos for this date were taken in Acadia National Park. It is one of our very best national parks for fall photography and it is still looking great this time of year. 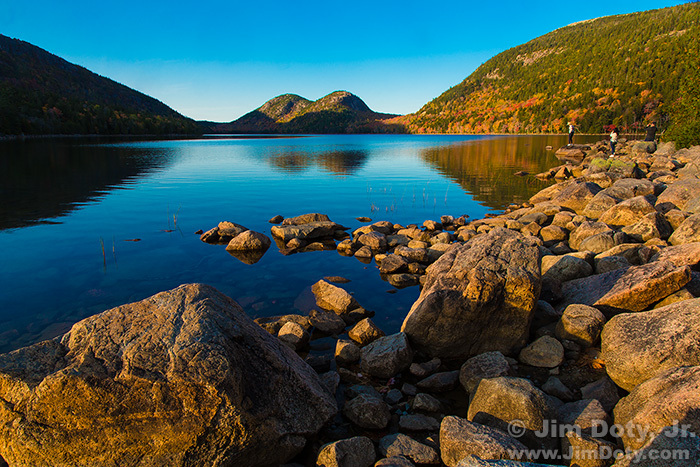 My favorite photo for this date (and it was a hard choice to make) was taken in the evening at Jordan Pond. It is such a beautiful location. You can see North and South Bubble Mountains at the far end of the lake. Dawn on top of Cadillac Mountain, Acadia National Park, Maine. October 21, 2017. My second favorite photo (and it is a very close second) was taken on top of Cadillac Mountain quite a while before sunrise. 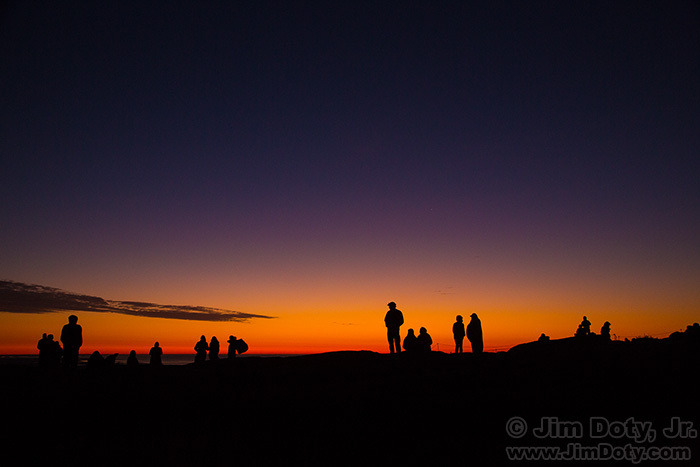 I wanted the silhouettes of the people waiting for sunrise. Sunrise, Cadillac Mountain, Maine. October 21, 2017. The actual moment of sunrise is my third place favorite image of the day. People applauded and cheered. A man about 20 feet from began to pray in Hebrew. Other people nearby got quiet. A small boy wanted to leave (it was cold and windy), but the father told him to wait and be quiet because “a man is praying.” It was a Great moment. 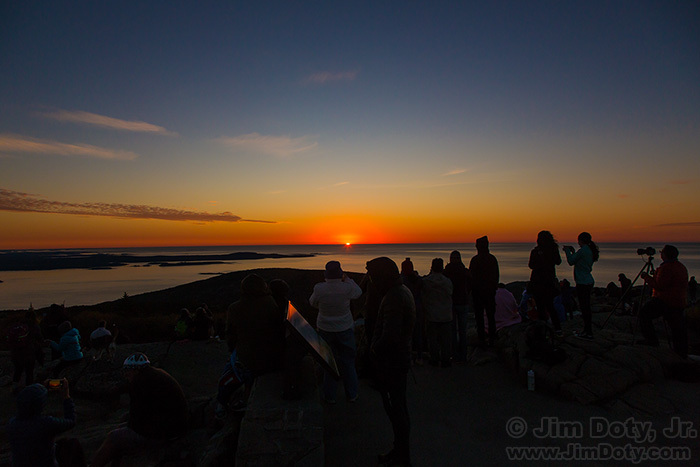 The top of Cadillac Mountain is the first place the light from the rising sun touches the United States. That may be part of the reason so many people gather here. The beauty of the place is another. There were hundreds of people all over the top of the mountain waiting for the sun. I did a quick count of 216 people from where I was standing and there were more people over the ridges out of my sight that I could not see until later as they got up to leave. Cadillac Mountain. Otter Point and Otter Cove in the Distance. Acadia National Park, Maine. October 21, 2007. 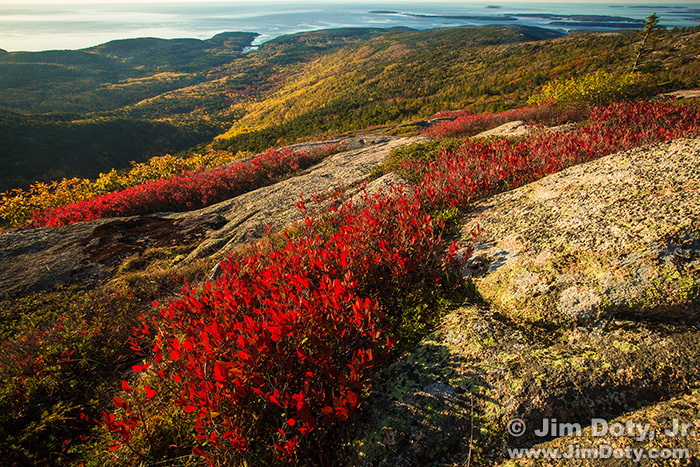 As the sun continued to climb in the sky I made my way over to the south side of the top of the mountain to catch the riot of red vegetation. It is important to step from one rocky slab to the next so as not to damage the fragile vegetation that grows between the rocks. Otter Cove, Acadia National Park, Maine. October 21, 2017. During the day I did the same thing as every other day, I wandered the park roads and photographed the scenery. Arrive early. (Yes, I’ve said this before.) I arrived at the parking lot near the top of the mountain an hour and ten minutes before sunrise and I counted 40 cars in the lot that were there ahead of me. Dozens of cars arrived soon after I did. It is my guess the parking lot was close to full an hour or so before sunrise. Once the lot is full you have to drive back to a parking lot farther down the mountain and hike the rest of the way up. It was cold and windy on top of the mountain. Bring something warm to drink. In addition to sweaters, jackets, and coats, a lot of people brought blankets to wrap up in.